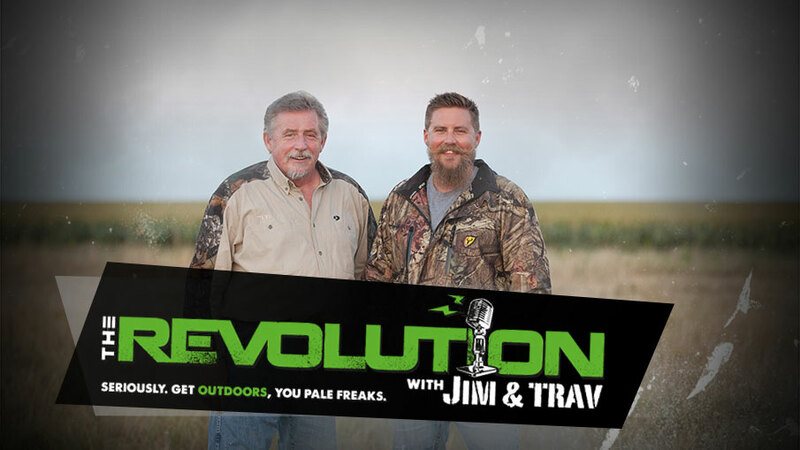 Late season waterfowl hunting is here and on The Revolution with Jim and Trav presented by Outdoor Channel, we're talking Winged Warriors. Tune in for tips, tactics and gear for hunting waterfowl and upland game. Joining them this week will be veteran waterfowler Chad Belding of "The Fowl Life with Chad Belding", famed big game hunter Steve West from "The Adventure Series", and Jared Wiklund from Pheasants Forever and Quail Forever. Veteran waterfowler Chad Belding of "The Fowl Life with Chad Belding" stops by to chat up the lengths he'll go to achieve epic concealment when waterfowl hunting and why it's imperative to volunteer and join a wildlife organization. Tune in to hear from famed big game hunter Steve West from "The Adventure Series" seen exclusively on Outdoor Channel. Steve will discuss the advantages of booking your hunts now, instead of later, for the coming fall seasons and why he risks it all, life and limb, to take his viewers to some of the remotest parts of North America each and every week on "The Adventure Series" seen on Outdoor Channel. Public Relations Specialist for Pheasants Forever and Quail Forever, Jared Wiklund, will prep us for the fun and excitement of the National Pheasant Fest & Quail Classic that'll be taking place on February 19-21 in Kansas City, and he'll breakdown the pheasant and quail forecasts and why he believes private landowners and CRP are the true unsung heroes of conservation.